This is the BOB Revolution SE Duallie (left) next to the BOB Ironman. There is also a double version of the Ironman called the BOB Ironman Duallie. The main difference between these two pushchairs are the wheels. The Ironman has a large fixed wheel at the front, and the Revolution has smaller wheels, with a locakable / swivel wheel at the front. The Revolution SE Duallie is more suited to every day activities, but gives the option of having a good off road double pushchair too. The Ironman Duallie will be for a serious runner or skater, or for going off road with. 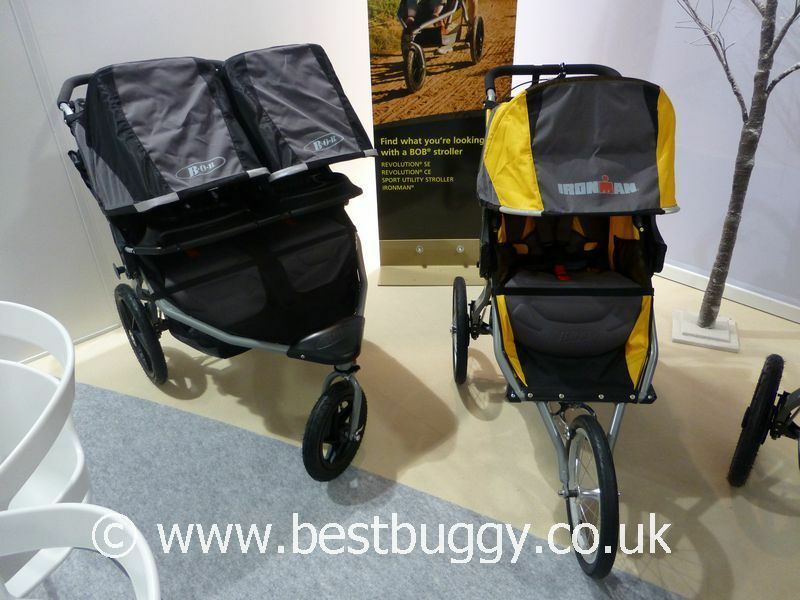 These two pushchairs fold in a similar way to the BOB Revolution SE single stroller. There are more photos of this pushchair, including some folded, here on Best Buggy.